Jump forward two years, and I’ve now got my hands on a few bottles of the beer that helped kick this whole blog thing off. 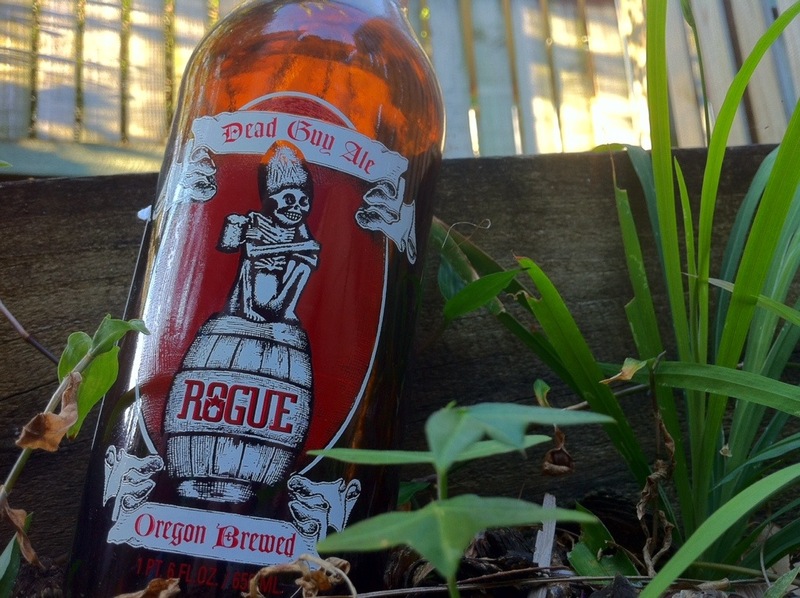 The 39th beer that I marked off the epic list, Rogue Dead Guy Ale. Ok, I’ll get to the bottle in a second; first I need to explain the name. I actually had to do some research for this, which basically involved going to the Rogue website. Long story short, a Dead Guy Ale tap sticker was created to help celebrate the Mayan Day of the Dead. People loved it, so Rogue turned it into the name and artwork for their Maierbock Ale. Somehow a link to the band ‘Grateful Dead’ was also made, though I’m at a loss to explain this one. I’m too young to understand I guess. Ok, there’s more to it than that. The aroma also has a fruity quality to it akin to Strawberries, coupled with some woody oak as well. There’s also a rather sharp bitterness at the end that helps to balance out the sweetness. The aftertaste also has a bizarre cooling effect, reminiscent of menthol or something…it’s really light, but definitely there. As it warms up it exposes a toasty, almost roasty character, along with a nutty quality that ties in with everything else to create something pretty enjoyable. I’ve got to be honest, this beer didn’t live up to my memories of it…although the original notes I made in Fremantle mention miso soup and bento boxes, so my memory may not be all that accurate. Thankfully I have another bottle ready in my fridge; perhaps now that my ‘memories’ of this beer have been dashed, I’ll be able to appreciate it for what it is instead of what I thought it was. I first had this one in WA too! It’s nice to see how something great began especially when it started with a beer. I checked my list and was surprised I never had a Rogue yet. My mission today is to correct that. Cheers.